Shiatsu is a bodywork modality that originated in Japan in the 1940s. Literally, the word “shiatsu” means “finger pressure”, pressure being the essential element in the practice of shiatsu. Generally there are two schools of thought and practice of shiatsu: the Namikoshi and the Masunaga schools. I believe the Masunaga school of shiatsu has had the most impact in the US and the West in general. Masunaga’s method uses the framework of Chinese medicine for assessment and treatment. In Chinese Medicine, health is the result of the life force (also known as “qi” in Chinese or ‘ki’ in Japanese) flowing smoothly through channels or meridians which travel throughout the body. Ki flowing more smoothly in the body is experienced viscerally and described in various ways by my clients. Many describe a remarkable and unusual state of clarity in their entire system after a session. Others describe their felt sense using words like ‘all connected’, whole’, ‘light’. Very commonly, clients feel a desire to substitute destructive habits with healthier choices about eating, mindfulness and movement. This desire arises spontaneously, seemingly corresponding to when the flow of ki is restored and the need for touch and focused attention is met. 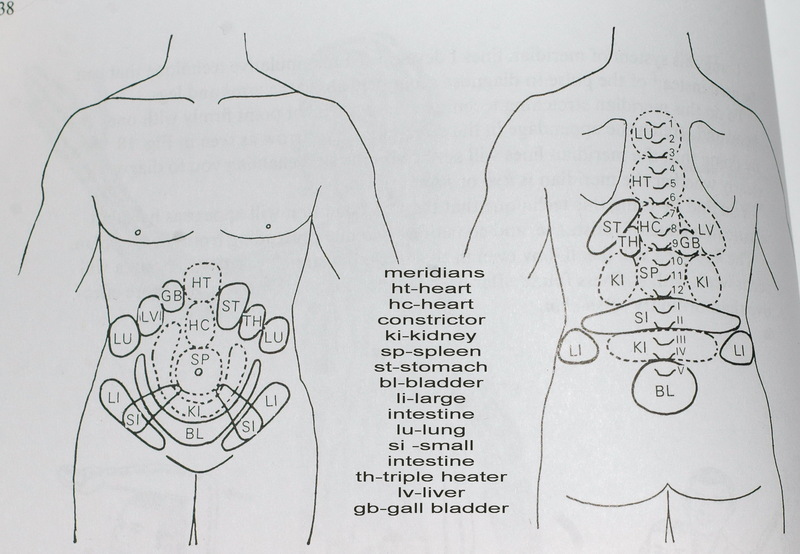 To assess the condition of the body, the shiatsu therapist usually begins a session by palpating the abdomen, which, in shiatsu, is referred to as the ‘hara’. In the tradition of shiatsu, and in Japanese culture in general, it is said that health ‘begins and ends in the hara’, making this a key place for assessing the condition of the body before and after a shiatsu session. Reflex areas in the hara reflect the state of energy in the twelve meridians that course throughout the body. In assessing the hara, the practitioner is looking for weak “kyo” areas and for excess “jitsu” areas. Jitsu areas tend to be easier to identify because they are often the places where pain and discomfort manifest. The root of the problem however is often hidden, less ‘noisy’, and often kyo. Most of touch in shiatsu is pressure, a relaxed, holding , “lean on” pressure coming preferably from the practitioner’s hara. This pressure not only restores a smoother flow of ki in the body, it also acts to regulate the nervous system. In our culture, where productivity, doing, rushing and a pressured lifestyle are normal, inordinately valued and often addictive, the sympathetic nervous system, responsible for fight and flight, dominates our way of being. This can feel good in the short-run but in the long-run this way of living compromises health on all levels. Through the holding pressure of shiatsu, the parasympathetic nervous system is activated, allowing the organism to shift to a state of profound relaxation, where blood and ki are redirected to the organs. fascia and muscles lengthen and open, alignment is improved. Correspondingly, the mind quiets and anxiety is soothed. The Chinese medicine framework of shiatsu and the power of touch make shiatsu a profound modality that directly affects the body on both the energetic and physical levels. Depending on one’s intentions as receiver and on skillfulness of the practitioner, it has the capacity for deep transformation and evolution.